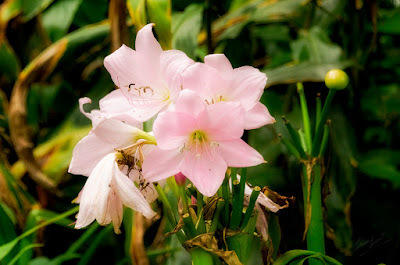 I saw these lovely pink Crinums at Victoria Park in Nuwara Eliya, Sri Lanka. they were planted in the park on areas that are wet (like edges of streams and ponds). Crinums as a genus have fruits that are adapted for water dispersal and many species can stand being inundated with water for some time. Too bad we don't see many of these being planted here, probably more suited to cooler climes. The pink flowers are sweetly fragrant. Pretty in pink - they were grown in spots where the ground was moist and somewhat muddy. 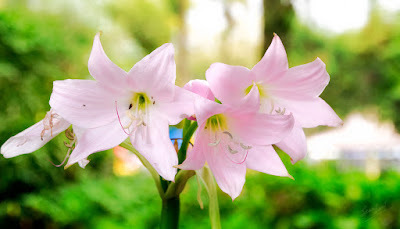 Dekat Sabah ini dekat area kampung lagi mudah nak jumpa orang tanam crinum compare to city. Maybe I balik 7Disember, hopefully sempat pergi that event.